The Republic of Bulgaria is situated on the Eastern part of the ethnically, culturally, and linguistically diverse Balkan Peninsula, covering about 22 % of its territory. The official language is Bulgarian and the capital is Sofia. 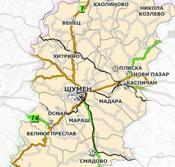 The Municipality of Shumen is located in the central part of Northeastern Bulgaria. The community administrative center is the city of Shumen. It is situated in the heart of the municipality and is an ancient city with more than 3200 years of history. Throughout the centuries, Shumen has united the priceless heritage of the Roman, Thracian, and Bulgarian cultures. Through years, Shumen has established itself as a cultural and educational center of the Northeastern Bulgaria. The unique history, the ecological environment, and the important geographical location are among the main reasons for the fast development of the region. Various museums, architectural monuments, art galleries are located in the city. Industrial Park Shumen is located on the outskirts of the city near the Besh Tepe and Ak Chorek districts. The immediate vicinity to the traffic junction connecting it to international and interurban roads as well as proximity to the largest ports and airports in the country make it a perfect place for all kind of commercial and logistic activity. In contrast to many other similar projects, Industrial Park Shumen is situated within city limits, in the center of the region. This advantage plays an essential role when selecting qualified personnel.